Nestled in the exclusive gate guarded community of Ritz Point, BEACH TRAIL BUNGALOW is a respite and haven for a relaxing beachside getaway. BEACH TRAIL BUNGALOW is located in the upscale area of Dana Point known as Monarch Beach. BEACH TRAIL BUNGALOW is tucked away in the center of the complex near the resort style pool and spa. It’s a corner unit on the second story of a 3 story building. Stroll along a safe, landscaped, pedestrian only corridor through 'The Links' Public Golf Course terminating to one of Dana Point's premier beaches… Salt Creek Beach. There is an expansive picnic area, a seasonal snack bar, and plenty of sand and surf! Nearby are wilderness and regional parks and trails with many biking & walking trails waiting for you to explore. 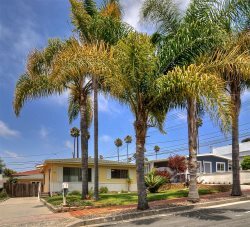 BEACH TRAIL BUNGALOW is located equal distance between LA and San Diego where there are endless opportunities for fun, food and entertainment. Within a few minutes drive you'll be at the world famous Laguna Beach or at the Dana Point Harbor for sport fishing, scuba/snorkeling, and windsurfing/boat rentals. The Dana Point Harbor is only one of two locations in Orange County where you can catch the Catalina Express for a day trip or overnight adventure to Catalina Island. Be sure to include a visit to the Orange County Ocean Institute and tour an exact replica of the tall ship 'The Pilgrim' sailed by our founding father, Richard Henry Dana, and noted in his famous novel 'Two Years before the Mast'. BEACH TRAIL BUNGALOW is located equal distance between LA and San Diego where there are endless opportunities for fun, food and entertainment. In an hour or less in either direction you'll find Disneyland, Knott's Berry Farm, Sea World, Lego Land, The San Diego Zoo, Sea Port Village, and The Gas Lamp district in downtown San Diego. Catch a professional baseball game and go see the Angels or the Padres - both stadiums are about an hour or less from BEACH TRAIL BUNGALOW. Or... choose to just stay home and relax in the community pool and spa which are heated all year 'round. There are two adult only spas also for your enjoyment. A fitness center is available in the community club house for your use at any time. There are yoga classes and massage also available for a small fee. Sleep 6: California King Bed in Master, two (2) leather sofas that convert to make futon style beds. Linens, towels, etc. all supplied at no additional charge.